The "submural beds" were small, narrow "forcing" or "warm beds" nestled at the base of the garden terrace wall. Among the items regularly planted here were several varieties of peas, Jefferson's favorite vegetable. The beds also contained several fig trees. 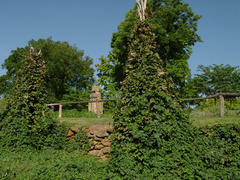 Monticello figs were unusually productive for a climate so far north, partly because of the microclimate of the submural beds.